"LucyPop", A new kind of casual fashion based on Japanese school uniforms - What's Lucy Pop? English > What's Lucy Pop? Our Lucy pop brand concept is created by the needs of teenagers through the planning collaboration and committee monitors who wish to create together. Lucy Pop is one of the fashion brand in Tokyo by Hibiki Inc.. The brand concept has been created by the needs of teenagers who love fashion “little bit different from everybody else”, unlike mass-produced products. Under “LucyPop”brand, scrunchie, uniform’s ribbon, tie and skirt etc. are available to suit their mood choosing to look like a “pop star, an innocent girl, or sophisticated women. It is also possible to coordinate with any other uniform piece with only one item, if you prefer to make your own “ little arranged style “. 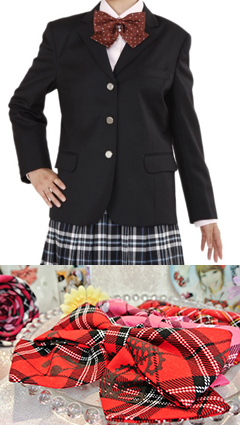 “Lucy Pop” school items are manufactured in cooperation with a leading school uniform manufacturer in Japan. You will find here our high quality and reliable school items which are carefully sewn in Japan. Want u to wear it like this girl! I would like to put on the fashion and goods like a uniform. A blazer, a blouse, a pleated skirt, a school ribbon, a necktie, the knitting best, a knitting cardigan, a polo shirt, a school bag, etc. When u want to look for the uniform item "a little different from everybody", it is to LucyPop of right or wrong and an online shop! GO!! Grandpa who thinks, is grandma welcome! Graduation ceremony of the daughter, entrance ceremony, the ceremony for uniform items, how about u ? Mother how to what to buy, and wondered whether trying to provide, please contact our shop by all means. Do you not enjoy a difference, coordination full of originality? To the girls in the girl studying in Japan, want to wear a Japanese custom-made uniform. For example, such a situation. How is the fashion show with a friend the party in a homestay place, a cultural exchange party, and after school? Don't you take a photograph to commemoration, either or wear a Japanese custom-made uniform in the recollections of studying abroad?